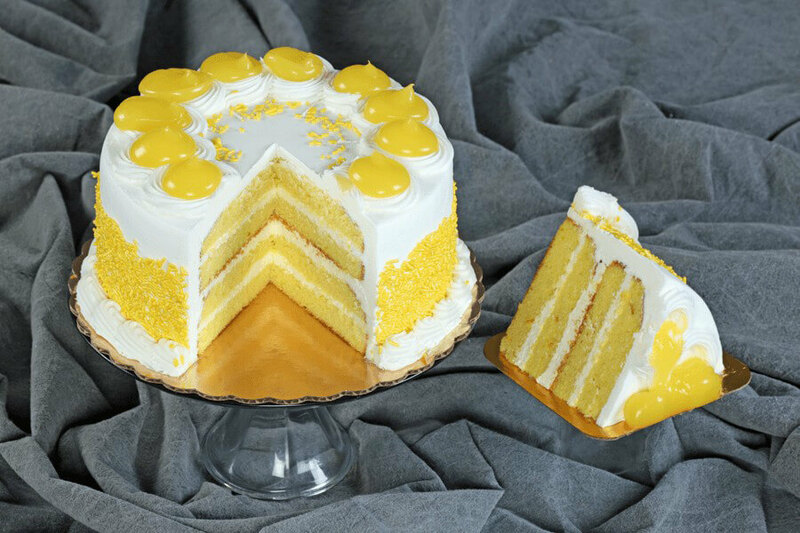 (8″ serves app 12) Four layers of UltramoistTM lemon cake with 3 layers of sweet lemon mousse butter cream frosting, engulfed in yellow sprinkles and finished off with tart lemon dollops. (8" serves app 12) Four layers of dark UltramoistTM chocolate cake drenched with 3 layers of dark chocolate fudge frosting in-between, on the sides, and on top. (8" serves app 12) Four layers of UltramoistTM vanilla cake with an overload of confettis throughout; filled with handmade champagne filling (no alcohol); finished off in vanilla buttercream and additional confettis. (6" square serves 6-8) Two layers of UltramoistTM chocolate cake sandwiched and frosted in a vanilla buttercream. It is decorated with neon colored swirls and paper bow. Bow color varies. (8" serves app 12) Two layers of UltramoistTM lemon cake with creme cheese swirled in the layers then frosted with a buttery cream cheese icing and finished off with yellow and white chocolate sprinkles.